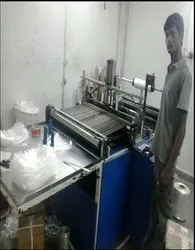 Established in the year 1997, P. K. Enterprises, New Delhi, is a company manufacturing a wide range of Shrink Packaging Machines and Importers of Polyolefin Shrink Films. Our product range comprises of Automatic Shrink Packaging Machines, 9 Micron Stretch Film, Polyolefin Shrink Film, L Sealer, Shrink Tunnel and Chamber Type Shrink Packaging Machine. Our products are well acknowledged among our clients for their variety of features that encompasses of durability, flawless performance, excellent quality, reliability and cost effectiveness. Our corporate vision is well supported by growing demands and appreciations from clients. We believe in constantly improvement of our existing products and services and coming forward with the new innovative concept for our product range. We have been able to achieve the desired position in the industry by welcoming the upcoming challenges and competitions. It further gives us strength to win the trust of our clients and widen our distribution network to international market. Our main focus is to take the new challenges and work accordingly in order to maintain good reputation in the market. We hold state-of-the-art infrastructure that comprises of all the advanced facilities regarding the productivity of large stock of our products. 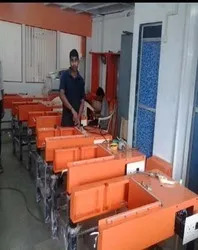 Our latest machines and other equipment help in providing quality range of products to our respected clients at competitive prices in the market and within an assigned time frame. The product range offered by us is acclaimed for its accordance with the international quality standards. These products are highly appreciated among the clients for its durability, strength, reliability and cost effectiveness. We offer these at competitive prices in the market. We have a clientele spread across the length & breadth of the country. We also have our machinery installed in Sri Lanka, Nepal, Bangladesh and Burma. We are looking to explore new horizons in international markets and set exemplary level of customer satisfaction. Our company is backed by highly skilled and experienced staff. They with their vast knowledge about the minute details and technicalities of our range of products help in fabrication of quality products. We are engaged in imparting regular training sections in order to make them familiar with our advance working style. Our diligent team also help us in providing various packing solutions to cope up with the increasing demands of our clients. Being a quality centric organization, we are working with an aim of touching the heights of success.